Power Flushing, Jet Flushing and Hard Flushing, are all expressions used in the heating industry to denote the process by which heating systems are forcibly cleansed used high velocity water, but at low pressure, so that no physical damage is caused to the system. The process is made more effective with the addition of powerful cleansing and mobilising agents such as Kamco’s FX2 and Hyperflush. All boilers are checked to make sure they are compatible with the chemicals. It is prudent to power flush a heating system immediately before or after fitting a new boiler to an existing system to prevent possible future problems. Many systems are found to contain corrosion and sludge, even if no flow problems have yet shown themselves. 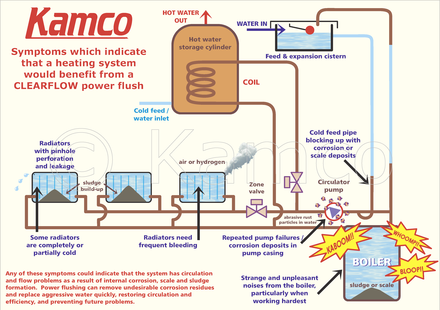 At NPH, we use the KAMCO CLEARFLOW power flushing process, this is a versatile, easy to use and highly effective method of flushing heating systems. By utilising CLEARFLOW system flushing pumps, heating systems can be purged of sludge, scale and corrosion deposits with minimal dismantling and disruption.